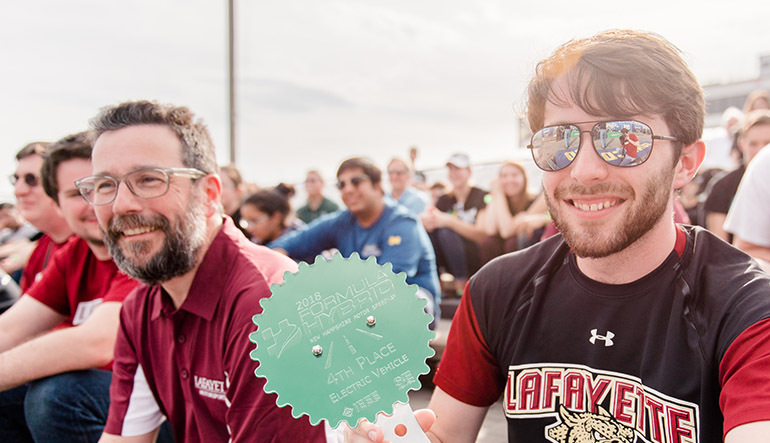 Facing raw, rainy New England weather and other competitive engineering schools, Lafayette’s formula electric vehicle team brought home an impressive fourth-place trophy in its first year at the international Formula Hybrid Competition at New Hampshire Motor Speedway. 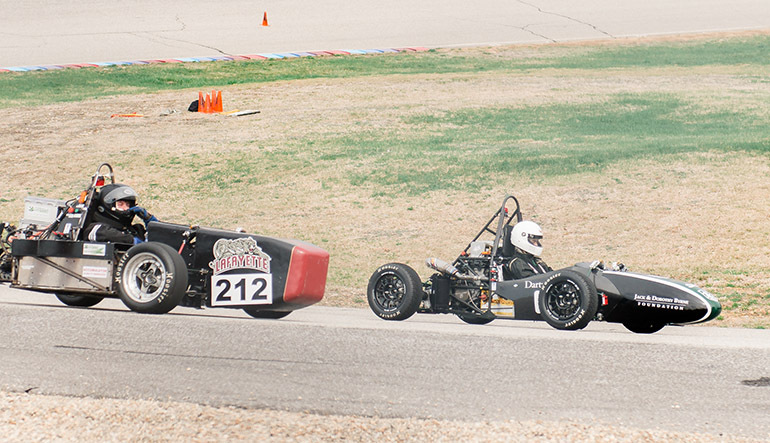 Nadovich said students worked around the clock to overcome difficult conditions, making it through all multidisciplinary technical inspections that allowed the team to race on the track in the endurance event over the multi-day competition the first weekend in May. Judges identified numerous issues with the car that needed to be corrected, and students had to scramble to disassemble and rework major components. Each time the car was put back together new bugs would emerge that needed to be diagnosed and repaired. The team managed to complete technical inspections just in time to participate in the endurance event. Because there was a threat of rain, Lafayette team members had a difficult final choice: Should they subject the car to a rain test or risk damaging unprotected electronics? Unfortunately, the car broke down part way through the endurance event, but the team’s point total was high enough for a solid fourth place, besting many well-known engineering schools such as Yale, IIT, and Tufts. Ten schools participated in the all-electric division. In preparation for the competition, the Lafayette team spent long afternoons testing and refining the electric car on the parking lot at Metzgar Fields. The car is controlled by 34 onboard computers, and its 60 kilowatts of power are fueled by four lithium battery packs, allowing for about a 40-mile capacity. It weighs about 900 pounds. 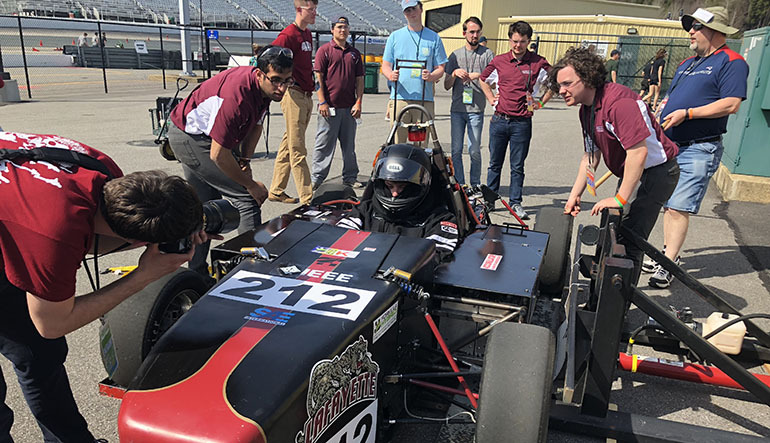 Suited up and strapped in for a test drive the week before the competition, John Alger ’18 (mechanical engineering) responded to a checklist of details from his teammates: voltage check, dashboard displays, cooling system, brakes and throttle. Designed for safety, the car is equipped with emergency stop buttons on both sides of the cockpit. In near silence, Alger piloted the car around the lot and through a maze of orange pylons; the car’s operation generates almost no noise, with only the crackling sound of gravel being kicked up by the tires. A deliberate spinout tested response of the braking system. Waseh Ahmad ’18 (electrical and computer engineering) said the cold, soaking rain, stressful conditions for an electric vehicle, and anticipation of putting the electric formula car to the test added to the thrill of the competition. The following day presented more challenges as Ahmad kept bouncing between the car and technical inspectors, trying to do as much as possible in helping the team move through inspections while making adjustments to the car. As Tuesday rolled around, things started to look up. The weather improved and team members started to get past their frustrations by figuring out the issues and developing a more sound method of problem-solving. “Everyone divided into different segments, helping each other and pushing forward,” Ahmad said. “By Wednesday afternoon, we had passed tech inspection and there we were, in awe of what we had just accomplished. Overall, working 16 hours a day was stressful to say the least but as long as someone’s spirit was alive, others rallied behind him. Nadovich said it was an incredibly rich learning experience, beyond what could be learned in a classroom. You all have come a long way since the formula team started in ’05, and we went to competition for the first time in ’06. The all electric must be a drastic difference from our old salvaged YZF-R6 motor, which had plenty of problems of its own.